The intelligent application of technology is increasingly seen as the best and most effective means to close the advice gap. Boston, February 16, 2017 – While the usual global themes supporting the arrival and growth of digital solutions exist in the U.K., the market also has a loud and government-backed challenge that digital wealth management solutions seem well-positioned to tackle: the advice gap. This troubling phenomenon, its depth, the regulatory regime around it, and the complete failing of the traditional market to make any impact are significant drivers pushing for a new means of delivery. These are great conditions to support the growth of the digital wealth management market in a geography and business sector in which change has for so long been slow. 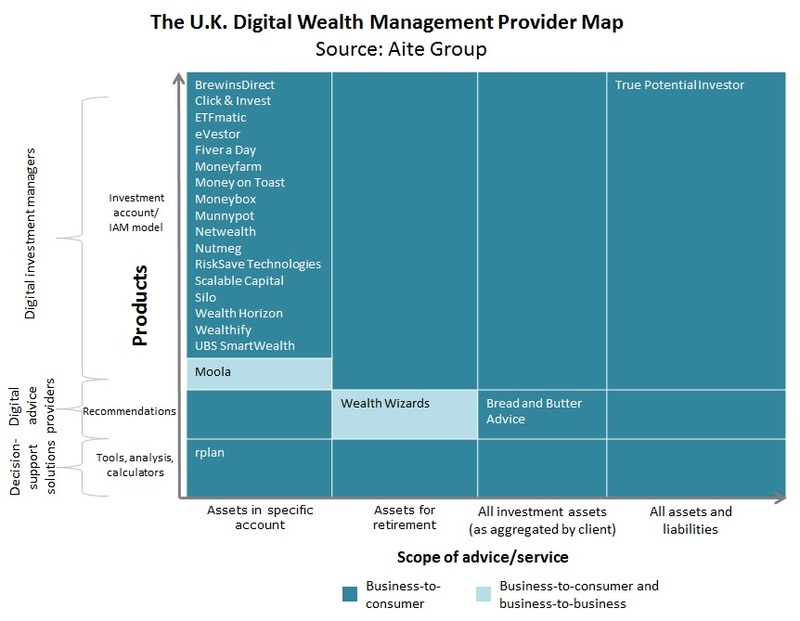 Based on secondary research, this Impact Report looks at 22 digital wealth management solutions operating, or soon to be launched, in the U.K. With a mix of different startups (ETFmatic, eVestor, Fiver a Day, Moneyfarm, Moola, Moneybox, Munnypot, Netwealth, Nutmeg, RiskSave Technologies, rplan, Scalable Capital, Wealthify, Wealth Horizon, and Wealth Wizards are highlighted) and, increasingly, traditional players from one business model or another (this report highlights Brewin Dolphin, CPN Investment Management, Investec Wealth & Investment, Killik & Co, True Bearing, True Potential, and UBS), the arrival of these businesses within the U.K. market represents a shake-up, threat, and influence to the old guard. This 45-page Impact Report contains seven figures and 27 tables. Clients of Aite Group’s Wealth Management service can download this report, the corresponding charts, and the Executive Impact Deck. This report also mentions Allianz, Barclays Group, BlackRock, Cofunds, Credit Suisse, Equiniti Financial Services, Fidelity, HSBC Group, Legal & General, Lloyds Banking Group, Parmenion Capital Partners, Royal Bank of Scotland Group, Saxo Bank, SEI, Standard Life Investments, State Street, Threadneedle, Vanguard Personal Advisor Services, and Winterflood Securities.